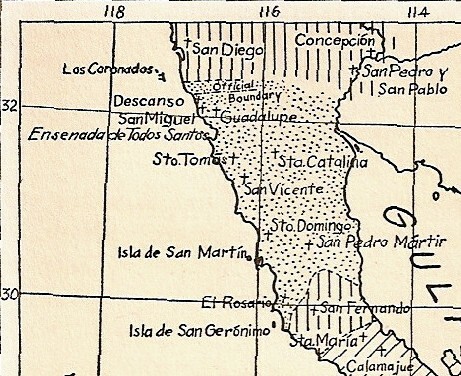 Depending on the source, there were either 8 or 10 more missions established in Baja California after the Jesuits were removed from New Spain in 1768. The first post-Jesuit mission was the only one founded in Baja California by the Franciscan Order, San Fernando Velicata, in 1769. In 1773, the California peninsula missions were handed over to the Dominican Order and the Franciscans continued establishing missions in Alta California. The Dominicans established up to 9 new missions, with the final 2 being disputed by some historians as being simply new locations for Mission San Miguel. The name and years for each mission will be followed by a recent photograph (taken between 2000-2008) then some will be followed by older photos to compare the sites. GPS waypoints are at map datum WGS84. On the final page are links to more Baja California history web pages, including the mission visitas and detailed maps and satellite images of the Camino Real mission road. A close-up of Peveril Meigs map to show the location of the final 10 mission sites in Baja California, north of Santa Maria. San Fernando Velicata was the only Franciscan founded mission in Baja California. The Dominicans assumed control of the Baja California missions in 1773.